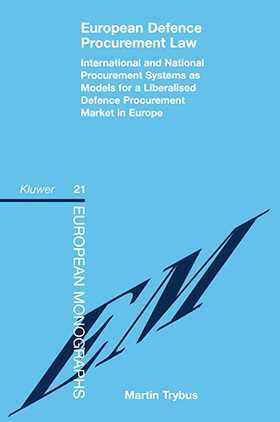 This book analyses in detail the current legal rules on defence procurement within the European Union, the limited regulatory efforts of the Western European Union, and the defence procurement regimes of three major states, France, Germany and the United Kindom. Using these various models, and also the current regime governing civil procurement in the European Union, the book then examines the legal problems of developing an pan-European Code on defence procurement, and suggests how these problems might be resolved. This excellent and timely contribution to the literature not only offers a comprehensive and authoritative analysis of the legal issues involved in liberalising defence procurement, but also provides stimulating suggestions on constructing a suitable regime. Whatever the eventual solution to the problems facing the European defence industry, there is no doubt that this book will make an important contribution to the policy debate. The Background to European Defence Procurement. I. The Current Position and Future Prospects of Defence Procurement in Europe. The Western European Armaments Group and the European Defence Equipment Market as a Model for Regulating Defence Procurement. II. The Western European Armaments Group and the European Defence Equipment Market. The EC Procurement Regime as a Possible Model for Defence Procurement Regulation. III. The EC Public Sector Procurement Regime. IV. The EC Utilities Procurement Regime. V. Defence Procurement and the EC-Treaty. National Defence Procurement Systems as a Model for a Common Regime. VI. France: Defence Procurement on a Regulated Basis. VII. The German Defence Procurement System. IX. The Background to a European Defence Procurement Code. X. The Coverage and Principles of a European Defence Procurement Code. XI. Procedures under a European Defence Procurement Code.